Any investment, large or small, demands results. Our clients have shared with us that investing in facilitation training from Leadership Strategies results in not only noticeable improvement in meeting results and organizational engagement, but clear improvements to the bottom line. Take a look at some of these examples. A Fortune 500 company, one of the largest financial services corporations in the world headquartered in the U.S., turned to virtual facilitation training in response to the growing, unique needs of its internal training and global technology department. The department consists of advanced IT project managers and senior managers who lead large internal projects with other business units where group engagement and meetings are rarely conducted in person and, instead, done virtually – a now common environment for many other large, global organizations. Given the multitude and complexity of their meetings and projects, the department realized its need for improved meeting facilitation skills. Awarded the prestigious Platinum Impact Award – the highest level awarded by the International Association of Facilitators, The United Illuminating Company (partner of Leadership Strategies) was recognized for significant results reached through the integration of facilitation and collaboration in strategic planning. Read about how their Safety Strategic Planning, led by Dorothea Brennan, resulted in significant safety performance improvements, including a 79% reduction in the frequency of motor vehicle accidents. The 6,500-person IT department of one of the largest insurance providers in the United States developed an improved approach to the inception phase of IT projects, incorporating techniques adopted by The Effective Facilitator into the Requirements Analysis methodology. The new approach resulted in as much as 45% reduction in time and effort for executing the Initiate phase. Seven pilot projects executed with the new approach resulted in a savings of approximately $100K, and projected savings from a broader rollout in 2013 is expected to exceed $600K. 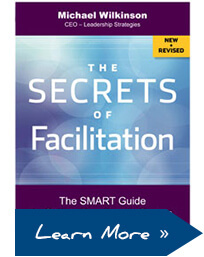 When Marathon Oil Corporation, a Fortune 100, independent international energy company based in Houston, TX, realized it needed a better process for executing strategic planning workshops they turned to Leadership Strategies for facilitation training. See how what started with two employees in a public class turned into an entire department of internal facilitators to support improved performance on projects of up to $1 billion. At Manheim United Kingdom (UK), a division of Manheim International – the leading global provider of used vehicles, facilitation skills had not been a focus for internal training and development. Never having any prior facilitation training, Manheim UK’s Rebecca Hartley, Human Resource Manager, attended The Effective Facilitator, a course offered by Leadership Strategies, Inc. (LSI). Since Rebecca completed the course, she has seen the benefits of facilitation training at both an organizational and personal level. A volunteer Strategic Planning Alliance, chaired by Aletha Burge, scheduled two Strategic Community Build sessions to discuss key strategic questions before the United Way of South Mississippi related its mission to create sustainable community change. This alliance addressed both how the change is implemented and the role of the alliance in achieving this mission in communities throughout southern Mississippi.